You know that the development of detailed and accurate HVAC, piping and plumbing 3D models requires a clear understanding of the design to fabrication to installation process. An advanced 3D detailing solution can make the entire workflow easier and more intuitive. Trimble® PipeDesigner 3D® incorporates today’s most advanced features including intelligent data editing, automatic layering and smart toolsets to quickly populate 3D models and drive standardization. Parametric modeling tools let you easily draw specialty equipment such as vessels, tanks and pumps. To further support a more efficient drawing creation, Trimble PipeDesigner 3D includes an extensive database with over 36,000 items with representation from 34 manufacturers. 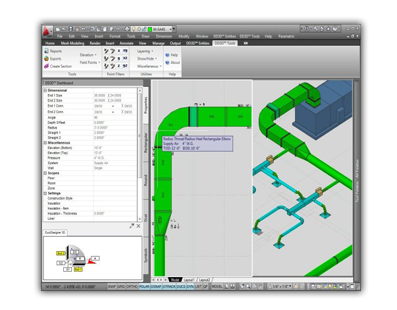 Trimble® DuctDesigner 3D® is the perfect CAD detailing software for sheet metal and HVAC contractors looking to detail duct quickly in an easy-to-use drawing interface. 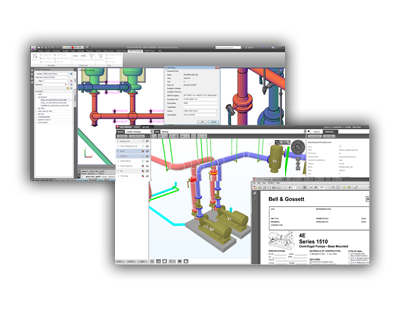 The full-featured detailing solution works the way you work-- featuring the ability to set up your company standards for fabrication and project settings with the robust Data Editor. Highly extensible and integrated into your project workflow, Trimble DuctDesigner 3D integrates with Vulcan CAM software and Trimble Field Link for MEP layout solution.